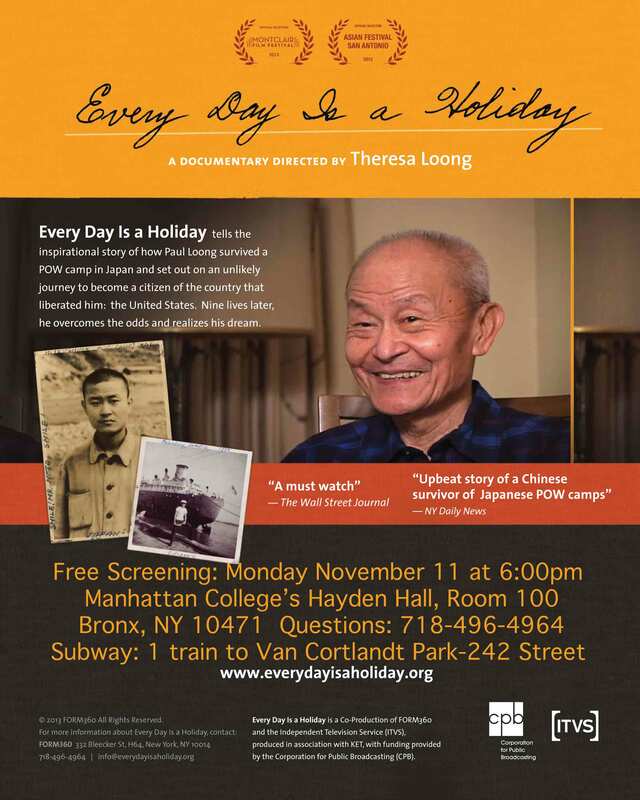 Manhattan College is hosting a free screening of “Every Day Is a Holiday,” the painful but life-affirming story of Paul Loong’s unlikely journey from Chinese teenager in Malaysia and a Japanese Prisoner of War during WWII to merchant seaman, Veterans Affairs doctor and naturalized citizen of the country that liberated him: the United States. Screening will start at 6:00pm. The film will be followed by a discussion with Dr. Loong and the film’s director, Theresa Loong. Please join us! Subway: Take the 1 train to Van Cortlandt Park-242 Street (last stop). For more information, call 718-496-4964.